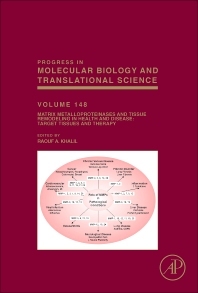 Matrix Metalloproteinases and Tissue Remodeling in Health and Disease: Target Tissues and Therapy, Volume, Volume 148, the latest volume in the Progress in Molecular Biology and Translational Science series covers a variety of timely topics, with chapters focusing on The Role of Matrix Metalloproteinases in Development, Repair, and Destruction of the Lungs, Matrix Metalloproteinases in Kidney Disease: Role in Pathogenesis and Potential as a Therapeutic Target, Regulation of Matrix Metalloproteinase in the Pathogenesis of Diabetic Retinopathy, Matrix Metalloproteinases in Normal Pregnancy and Preeclampsia, and Matrix Metalloproteinases, Neural Extracellular Matrix, and Central Nervous System Pathology. This volume is the second part of a thematic on matrix metalloproteinases and tissue remodeling in health and disease. It focuses on the role of MMPs in other systems, target tissues, and pathological disorders and the potential benefits of MMP inhibitors in various disorders.